Are you looking to have your Lennox furnace serviced and you live in Markham, Toronto, Scarborough or Vaughan? At Constant Home Comfort we offer furnace services and installations for Lennox products. We also service other leading brands like American Standard, Keeprite, Goodman, and Air-Flo. If you have decided to replace an existing furnace or adding square footage to your home through renovation, it is always a good idea to think about changing your furnace size to fit your home. When choosing a new Lennox furnace, there are a couple of factors that should be considered, including the size of the furnace, the available space in your home, and the overall heating efficiency of that furnace. The wrong size of your furnace can affect the efficiency of your heating system. 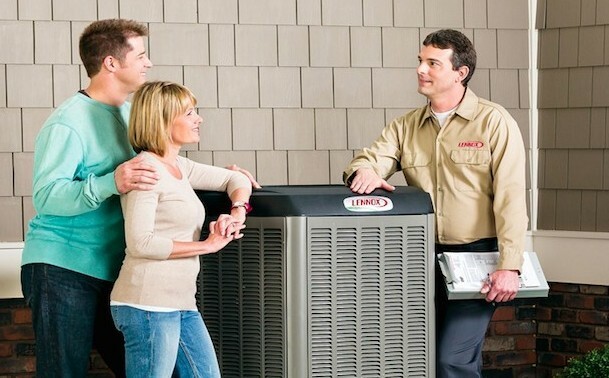 When choosing your furnace system you should consider the capacity, efficiency, and zoning systems of your furnace. The capacity of a furnace is calculated by how much space a furnace can heat while maintaining comfort and efficient energy use. When it comes to choosing your furnace, choosing a bigger furnace is not necessarily better because it might not be as efficient. Choosing a furnace that is too small can also be inefficient, as it may not be powerful enough for your home’s heating needs. It is always a good idea to find a professional that can help you calculate how much heat your home needs to stay comfortable, how much heat your building might lose, and the amount of BTUs (British Thermal Unit) you will need for your whole house. When you are seeking a furnace, an efficiency rating on a furnace dictates its ability to convert fuel into heat. The higher the efficiency rating, the less fuel is wasted through the furnaces exhaust vents. If you choose a furnace with high efficiency ratings, your systems can have an efficiency rate of 90% – 99%. Choosing a more efficient furnace can also help keep your energy bills down, saving you money in the long run. Plus, a more efficient furnace is better for the environment. If you are installing a furnace, installing a zoning system is a smart way to get the most from your new unit. These systems divide your home into groups called zones that can be controlled by separate thermostats. Creating thermostats for each room helps to normalize the temperatures in your house to eliminate hot and cold areas throughout your home. Zoning systems can help you save your energy bills by using the right amount of energy in your home. Determining which furnace system for you is a very important decision because it affects the overall comfort of your own home. At Constant Home Comfort, we can help you choose the right furnace system for your home to help you cut energy bills and maximize your own home comfort. Constant Home Comfort offers services in Toronto, Markham, Scarborough and Vaughan. We can service your Lennox Furnace system today! Fill out a form today or call us at 1-888-675-5907.